Established in 1908, the University of British Columbia is the oldest institute of higher education and learning in the province of British Columbia, Canada. Spread across two campuses in Vancouver and Okanagan Valley, UBC is home to more than sixty-thousand students in its various faculties— Arts, Science, Applied Science, Medicine and Business. UBC has consistently ranked in the top three research universities in Canada, and enjoys a strong reputation worldwide. In the 2017 QS University Rankings, UBC holds the 51st rank worldwide, and the 53rd rank for its Engineering faculty. The US News and World Report ranked the University among the top 20 public universities in the world in 2015. UBC’s enduring heritage of academic greatness has, over the past century, produced a number of Nobel Prize winners, Rhodes Scholars, and most notably, the incumbent Canadian Prime Minister, Justin Trudeau. With more and more Indian students choosing Canada over the USA for their higher studies options, UBC emerges as the perfect choice for the academically inclined, yet financially prudent grad school aspirant. Cofnused between US or Canada for your Masters? Get an ebook compiled by admissions experts, with the comparison! Download your “USA vs Canada” eBook now! With an acceptance rate of 52.4%, UBC is quite stringent with its acceptance, choosing to only admit students who have in the past demonstrated extraordinary academic abilities and intellectual stamina. Therefore, a strong academic record is a must-have. Unlike schools in the US, Canadian universities are usually more relaxed when it comes to application deadlines. At UBC, for instance, if you wish to apply for the Winter ’18 intake (starting January), you are expected to apply no later than August. This gives you plenty of time to finalise your applications and prepare your documents. Canada is well-known for its highly subsided, quality higher education, which makes studying abroad in Canada a wonderful option for those who want a world-class education without breaking the bank. 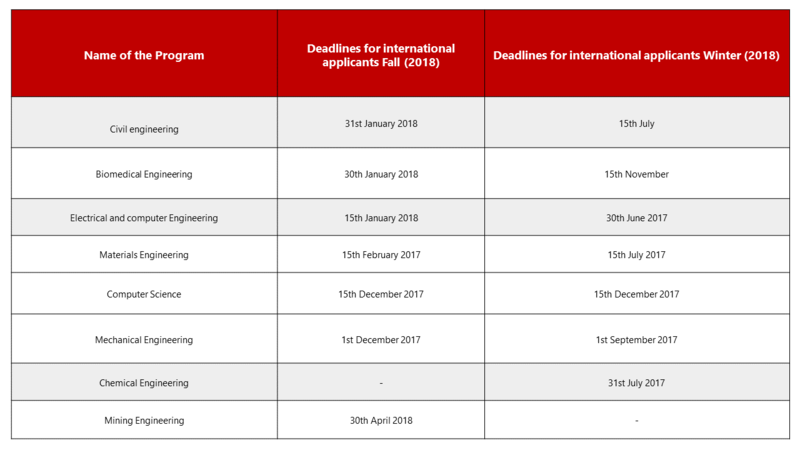 Want to know upcoming deadlines of top universites? Get your ultimate guide to all Top 20 University Deadline! Grab your copy! As an international applicant, you will be expected to pay the ‘Schedule A’ fees, spread across three instalments in a year. For each instalment, you will have to pay $2812 (Rs 1.45 lakh approximately), or $8436 (Rs 4.35 lakh) per annum. The tuition fee for an MS degree, therefore, will set you back by approximately ₹8.7 lakh. A number of generous scholarships, loans and bursaries are available to make your education at UBC more affordable. UBC also offers Research and Teaching Assistantship programs to meritorious students to help meet their financial responsibilities. Depending on your programme of choice and your personal circumstances, living expenses at UBC will cost you about $26,727 annually (₹13.7 lakh). Of course, this is only an approximate figure-if you decide to work part-time, or if you are awarded a Teaching/Research Assistantship, this number will change accordingly. UBC also has a Work Learn programme in place, which allows all UBC students to undertake a wage-based part-time position on campus, to bring down the cost of living considerably. UBC is situated in the heart of Vancouver, one of Canada’s busiest, most culturally diverse cities. Embraced by the North Shore Mountains on one side and the scenic Mount Baker to the other, Vancouver is home to a beautifully diverse arts, culture, nightlife and music scene. Nature enthusiasts can satiate their thirst for the outdoors by whale-watching at the Georgia Straits, sturgeon-fishing at the Fraser River, or simply biking down Vancouver’s gorgeous cobble stoned streets. Whatever your taste and preference, Vancouver truly has something for everyone. UBC boasts of the largest university residence in Canada, with more than 12,000 students living in 13 residence halls. Depending on your budget and preferences, a number of comfortable student residence halls are available to you, including Marine Drive, Fraser Hall and Thunderbird. 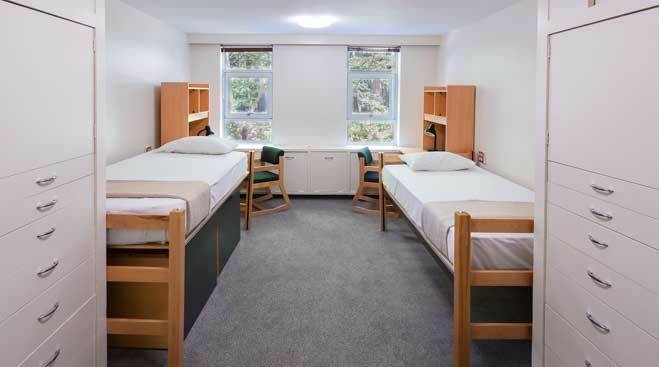 Most halls come equipped with WiFi, dishwasher, pest control, laundry and other utilities. UBC takes a proactive approach to student health and well being, and believes good health to be at the heart of academic performance. Registered doctors and nurses are available on campus round the clock to provide physical health care (like allergy shots, immunisation and surgery) as well as mental health services including counselling. Additionally, nurses from the Student Health Service set up booths around the campus each week, where students can drop in at their convenience and get tips, information and advice regarding their personal health. To foster a greater sense of campus safety, a number of blue phones are installed at various points in the campus, and can be used in times of distress to ask for directions, to report a case of crime or harassment, or to talk to a health expert if you are feeling ill.
Additionally, Safe Walk is a transport service which accompanies students, teachers and visitors who feel unsafe walking alone, across campus. The Office of the Ombudsperson is an impartial, confidential resource for students, and works to ensure a safe, just and respectful environment for students by taking complaints and arranging appointments with students. With more than 40 restaurants, cafes, bistros and food trucks scattered around campus offering a plethora of gastronomical delights, students at UBC never run out of dining options. Be it Starbucks, Domino’s Pizza or the Canadian favourite Tim Hortons, UBC has the choicest of culinary options just a stone’s throw from you. 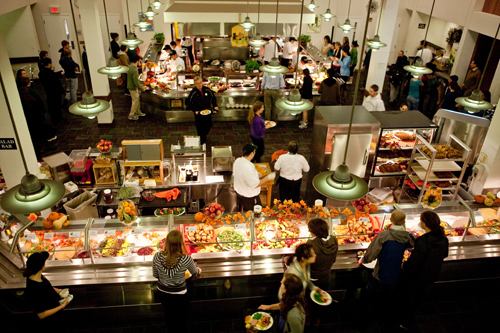 Alternatively, you could opt for one of the three available meal plans and save up to 12% on dining every semester. Your life outside the classroom is paramount to your overall development and well being, and UBC truly understands this. With more than 370 student clubs and societies catering to a wide range of interests-be it foosball, astronomy or cooking-you can be sure to find a niche for yourself and meet like-minded students. In your free time, don’t forget to cheer on for the Thunderbirds, UBC’s varsity basketball team! It would be a vast understatement to say that UBC has one of the most exciting campus lives in Canada. 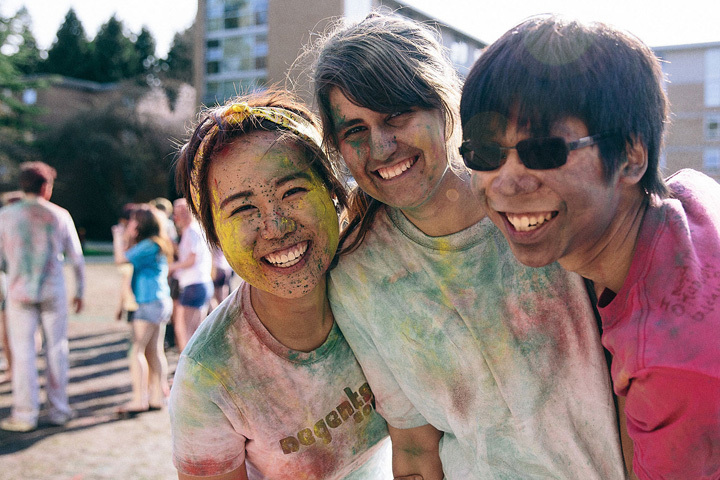 From social mixers, concerts, spring break trips to quiz nights, bake sales, yoga workshops and art exhibitions, the UBC campus is almost always brimming with activities and events. Don’t believe us? Take a look at their events calendar! Additionally, the UBC campus is home to a number of museums and galleries, including the MOA (Museum of Anthropology), the Morris and Helen Belkin gallery, the Beaty Biodiversity Museum and the Pacific Museum of the Earth, all of which are open to students and visitors 365 days a year. 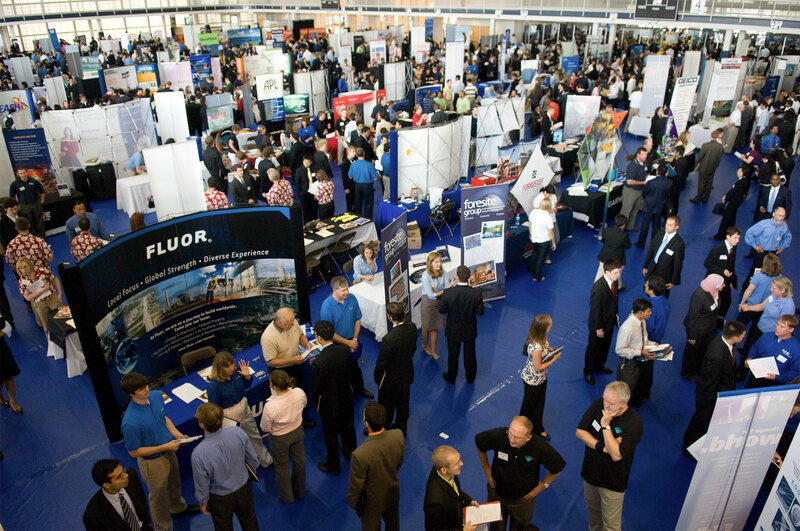 The UBC Students Services is a central source of student career development and welfare. It is dedicated to positioning students in exciting jobs in and around campus. CareersOnline is the online job portal for students and employers alike, and allows you to find the job or volunteering opportunity most suited to your qualifications and requirements. We hope you found this University Review helpful! If you are keen about applying to the University of British Columbia and are unsure of how to proceed, you may get in touch with the admissions experts at GREedge, who will be happy to guide you. A number of career events and workshops are held throughout the year to help students boost their chances of employment. Want a step by step guide to your MS Application? Get an ebook compiled by admissions experts, outlining all the steps you need to take to make a perfect application Download your eBook now! Coming up next, we’ll look at a university all the way across the other continent – Europe. Comment and let us know which university you’re looking forward to next! But in the university website It is showing GRE is optional. 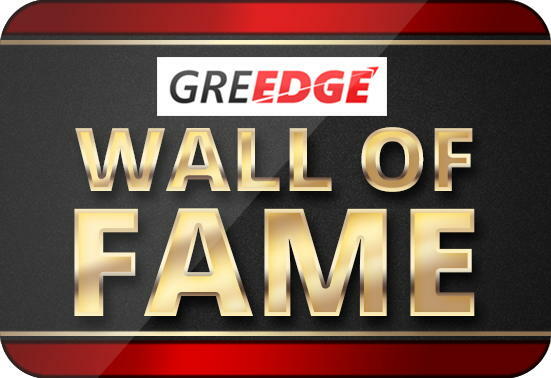 Is Barrons’ Enough for Your GRE Verbal Preparation?